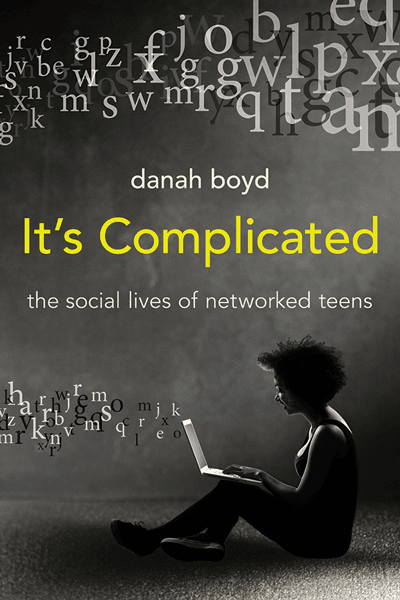 I have just finished danah boyd’s new book, It’s Complicated: The Social Life of Networked Teens. danah was (and still is) a researcher at Microsoft Research when I was there in 2011. I didn’t interact with her too much as I was focussed on other matters but it always struck me that her investigations into the behaviour of teenagers would prove very interesting. The book does not disappoint in that regard. I couldn’t put it down. Like Emily Bazelon’s recent book on bullying and Lenore Skenazy’s Free-Range Kids, it’s underlying heart is to bring common sense to an important set of issues in parenting. However, unlike those books, its head is most clearly in the academic rather than journalistic space. This is not to deride journalists, of course, but there is a noticeable difference between work that reports on research and work that is the report on research. boyd’s book falls into the latter character but somehow manages to do so in a written style that is fluid and engaging. It took 8 years of research, mostly involving in-depth interviews with teens and some parents, for boyd to put together a model and evidence of how teens interact and behave in the digital world. Along the way, it was clear that boyd had a theory as to how teens were motivated and also a hypothesis: that the digital world has changed little in those motivations and only the expression and instruments of their behaviour and interaction. What is more, like the past, parents’ motivations have not changed too much and teenager choices are driven as much by parental actions (or, in most cases, restraints) as they are by teenager desires. In trying to conduct research over that period of time with regard to the digital world, there is a clear challenge: the instruments and platforms teens used to engage, digitally, changed. When the research started out MySpace was king, then Facebook and most recently, literally as the book was going to press, SnapChat and Instagram. There was a real danger the book would feel dated. However, boyd turns that into a strength. Yes, sure, this teen was using MySpace when they were interviewed but here is what that platform has in common with others today. It is basically the same deal. So let me do incredible injustice to the book and try, as briefly as possible, to summarise its findings. Teens are extremely social and want to interact with one another (so if you think looking at a screen is a sign of isolation, think again). What is more, they want to engage in that social interaction independent of adults (so if you think your kids don’t want you around, remember when you were a teen). Thus, teens are trying to balance being social (sharing) with being independent (privacy). They are (a) like teens forever and (b) like people. That balance is hard to learn, understand and manage. Now insert into that mix parents (and teachers and others). Those parents are concerned for safety and have their own, largely out-dated model of what social and anti-social behaviour is. They also don’t really know what they are doing but have an image of a ‘stepford’ like teen that they want in the end. (I should say boyd is more diplomatic than I am being here but I think that captures the true essence of the average parental mindset). So the parents engage in behaviour regulation — usually a series of prohibitions. For instance, to keep teens safe they don’t let them out. Then they are surprised when their kids want to spend all their time on social media and complain that they are not engaging in real interactions. Yes, because the only ones they would have left is you and they don’t want that. If you want to see them have real social interactions, they have to be left out. This is why they go to football games (who would like to do that otherwise) or rush to school early. They are desperately pushing through the cracks to get more interaction with one another. Everything else follows neatly from that model. It is just pure substitution, plain and simple. What is more, any of the dangers from online activity — addiction and predation — are not borne out by any data. Instead, there is a new danger — that the assumption by adults is that kids actually understand digital technology. They don’t. That means when they are told by teachers that Google is good and Wikipedia is not, they actually believe them! They over-trust one and ignore the other. At the same time, they find it hard to work out what will last and what will not. Finally, and this is important, if parents try to peek in on teen’s digital world’s — by cyberstalking them on Facebook — they will either force teens to be cryptic to obscure potential trouble or simply not understand the context of the behaviour they are seeing. All that said, I have one quibble with the book and also one comment. The quibble is the title “It’s Complicated.” It really isn’t. As you read this book, you’ll see it is actually quite simple: that’s what a good theoretical model gets you. Teens need to be evaluated as (a) not being unusual; (b) acting like human beings and (c) being given the benefit of the doubt rather than objects of fear. Just stepping back and asking yourself “if this thing I see my kid doing is actually OK, what is really going on here?” For instance, I have seen my daughter stick her tongue out, take a picture and “share” it on SnapChat. One interpretation of this is: why would you do that? The other interpretation is: it is good that you chose to do that on SnapChat where the picture will last only 10 seconds? In one interpretation, she is an unusual deviant. In the other, she is someone who has actually learned what appropriate behaviour is and sensibly chosen the right technology for the job. My point here is that it is not complicated at all. It is really simple: just chill, it is normal behaviour going on and no permanent harm is being done. Indeed, it is probably all for the best. I’ve only scratched the surface of this issue in this review. boyd’s examples are great and really give you a sense as to what is going on. But here I come to my comment. There is one limitation of being a book grounded in what we know and that is, this isn’t a parenting book. There is no big advice chapter in the end. boyd doesn’t tell parents to chill although you would have to be a moron not to take that away. She doesn’t list a set of advice to follow. That is because she hasn’t evaluated how to deal with these things and so cannot speculate on it. Moreover, she hasn’t studied what happened before (should younger kids be on social networks) and what happens after (do teens that are on social networks turn out to be ‘better’ young adults). The focus is on teens and nothing else but, in many respects, that still left me wanting more. Nonetheless, that does not mean this isn’t a book for parents. It is a book that will give you perspective and reduce the fear in managing teenagers and give you the opportunity to have a better relationship with your teens; even if it is not the ideal fantasy in your mind. The main focus is L-shaped isoquants. That said, I’ll next note that my 13 year old niece is visiting from Michigan (our daughter is four). She’s just on her new iphone 5 constantly, and just loves it, and is the exact opposite of isolated. She’s constantly connected with her friends across the country. As my daughter’s four, I haven’t thought much about this, other than the strong advice to really limit screen time at her age – By the way, The Second Machine Age gives a huge endorsement of Montessori schooling. We came to that conclusion before, and put our daughter in a Montessori preschool, but after the Second Machine Age we’ve definitely decided to do Montessori at least until high school. Anyway, the big concern I have with all this smart phone and network time is how ADD it is. So much time on all this quick and constant stuff, so little on delayed gratification, long deep thought and effort, really studying something a long time deeply with concentration, playing chess, the constant interruption of these phones, and constant short term action, seems like a real and serious threat here.